Whether you are planning to try cross country skiing for the first time or heading out for the first time this season, a lesson will get you on the right track! You've probably heard that if you can walk you can cross country ski. Well that's true, but walking on cross country skis is not much fun! All of our lessons are 1 to 1.5 hours in duration. Sign up yourself for a private lesson, bring a friend for a semi-private lesson or join our Introduction to Nordic Skiing or Intermediate Nordic Skiing Class. Our group lessons usually include 3 to 8 students. Skiing to many newcomers can feel odd and unfamiliar. This feeling is also common in skiers who only have an opportunity to hit the trails once or twice a year. Many even question whether their continued effort is worthwhile. Since over half of the first time skiers call it quits after the first time, our goal is to make skiing a familiar experience through a gentle, positive and fun approach. This first experience will be so much fun, you'll want to come back again and again - and maybe even bring your friends! This class will familiarize you with the equipment and its use on flat and gently sloping terrain. When you feel comfortable with these basic skills, sign up for our Intermediate Nordic Skiing lesson. This class will help you improve your basic skills and introduce you to some new techniques. You'll learn how to improve your rhythm, extension and balance in the diagonal stride while developing advanced skills for turning and braking. You'll also be introduced to basic skating techniques and other energy saving skills. 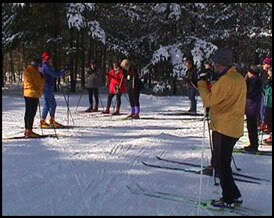 If you're not quite ready for this class, sign up for our Introduction to Nordic Skiing. Rates are person including equipment, the lesson of your choice and daily club membership. Group Lessons are available weekends and holidays at 10:30 a.m. and 1:30 p.m. Please call the Touring Center to make a reservation. Semi-private and private lessons may be scheduled by appointment.